Portable water transportation system for facility maintenance. United Continental Holdings is the world’s largest airline by fleet size and number of destinations served. United operates hundreds of facilities around the world ranging from aircraft hangars to training facilities and corporate office parks. One of United’s Elk Grove, IL airport facilities contacted Wastecorp Pumps to see what kind of solution we offer for fresh water hauling around an aircraft hangar including maintenance services, landscaping needs and more. Wastecorp recommended that United Airlines go with the Wastecorp brand water buffalo, model WB300 Series, 325 gallon water tank system. A water buffalo is a type of water hauling system that does not include a pump, hosing or valves. Water is simply gravity fed to the source needed. 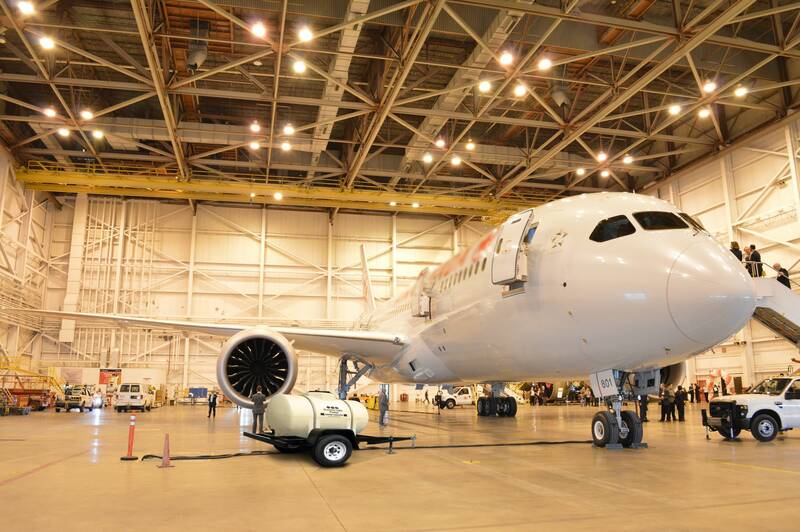 Since the airline industry uses high pressure equipment to move the water for hangars and aircraft maintenance, the Wastecorp WB-300 series is built with large port openings to help maintenance crews use the necessary equipment to access the water. Since maneuvering around sophisticated aircraft maintenance equipment requires plenty of clearance and operator visibility, we designed the WB-300 Series with a low trailer frame and extended goose neck to make filling and discharging the tank safe for crews and easyto-use. As an ISO 9001 certified water buffalo manufacturer, Wastecorp Pumps works with airports and airlines worldwide for water transportation equipment. The airline industry is a non-stop, high traffic business that depends on reliable, high performance equipment to keep aircraft, passengers and freight moving. Wastecorp delivers. United Continental Holdings operates hundreds of facilities worldwide. Wastecorp’s Water Buffalo WB-300 Series, was selected by United’s Elk Grove, IL airport facility for fresh water delivery solutions.